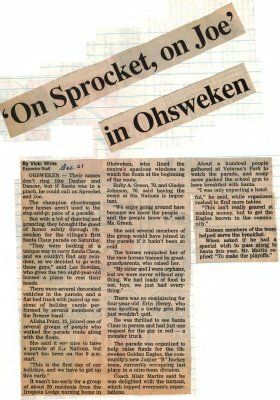 "'On Sprocket, on Joe' in Ohsweken"
OHSWEKEN - Their names don't ring like Dasher and Dancer, but if Santa was in a pinch, he could call on Sprocket and Joe. The champion chuckwagon race horses aren't used to the stop-mid-go pace of a parade. But with a bit of dancing and prancing, they brought the guest of honor safely through Ohsweken for the village's first Santa Claus parade on Saturday. "They were looking at a unique way to carry Santa Claus, and we couldn't find any reindeer, so we decided to go with these guys," said Les Sowden, who gives the two eight-year-old horses a place to rest their heads. There were several decorated vehicles in the parade, and a flat-bed truck with jazzed up versions of holiday carols performed by several members of the Breeze band. Alisha Point, 15, joined one of several groups of people who walked the parade route along with the floats. She said it was nice to have a parade at Six Nations, but wasn't too keen on the 9 a.m. start. "This is the first day of our holidays, and we have to get up this early." It wasn't too early for a group of about 25 residents from the Iroquois Lodge Nursing home in Ohsweken, who lined the centre's spacious windows to watch the floats at the beginning of the route. Ruby A. Green, 78, and Gladys Johnson, 70, said having the event at Six Nations is important. "We enjoy going around here because we know the people ­and the people know us," said Ms. Green. She said several members of the group would have joined in the parade if it hadn't been so cold. The horses reminded her of the race horses trained by great-­grandparents, who raised her. "My sister and I were orphans, but we were never without anything. We had loads of food to eat, toys, we just had everything." There was no reminiscing for four-year-old Erin Henry, who was sporting a toothy grin that just wouldn't quit. He was thrilled to see Santa Claus in person and had just one request for the guy in red - a monster truck. The parade was organized to help raise funds for the Ohsweken Golden Eagles, the community's new Junior "B" hockey team, currently occupying last place in a nine-team division. Coach Blair Martin said he was delighted with the turnout, which topped everyone's expectations. About a hundred people gathered at Veteran's Park to watch the parade, and many more packed the school gym to have breakfast with Santa. "I was only expecting a handful" he said, while organizers rushed to find more tables. "This isn't really geared at making money, but to get the Eagles known in the community." Sixteen members of the team helped serve the breakfast. When asked if he had a special wish to pass along to Santa this year, Mr. Martin replied: "To make the playoffs." A group of native princesses march in front of the first-ever Six Nations Santa Claus parade in Ohsweken. Sowden, Les ; Point, Alisha ; Green, Ruby ; Johnson, Gladys ; Henry, Erin ; Martin, Blair.